Ever since I was a young girl I have always marveled at the way that God is a personal God who knows not only the hairs on my head, takes cares of the birds of the field, but also uniquely and personally shows Himself over and over again. One of those ways for me has been through dates of times and days over the months and years. Last year, when Path of Hope was released, I shared that the book was released on the exact day that I had my first appointment for Lyme Treatment. While I have since switched doctors and medical facilities since that appointment, that time and treatment was the foundation that the Lord used to first save my life, discovering that this journey would also include Skin Cancer as well as fighting Lyme. This year with this release I admit that I was excited to see that it would fall on the first day of Lyme Disease Awareness month. I started writing this specific book in December 2013 so the timing of the release date brings a smile to my face. At the time I was deeply struggling with loneliness and grief, fear, frustration, anger, hopefulness and hopelessness in addition to a myriad of other emotions when a stack of beautiful letters arrived at my front door from some former students. These letters (which I have carried with me in a special notebook and are tattered right now) spoke beautiful truth of God's love, His power to do the impossible, and His never ending mercies for each morning. Several months later, in April 2014 I had the brief opportunity to try to thank these beautiful ladies for their gift. Honestly, I was so overwhelmed with emotion of seeing these dear ladies, being back in my former classroom, and being with my former students and staff members that I loved so much that my words were so choppy and bumbled I wish I could do the entire day again. From the precious words of encouragement and love that I received afterwords, I knew though that my heart had been heard and that was a beautiful gift to my soul. This past week has been especially difficult as I have been fighting intense pain and struggling more than ever. But this past week in many ways is once again reflective of the entire journey... and in many ways life. 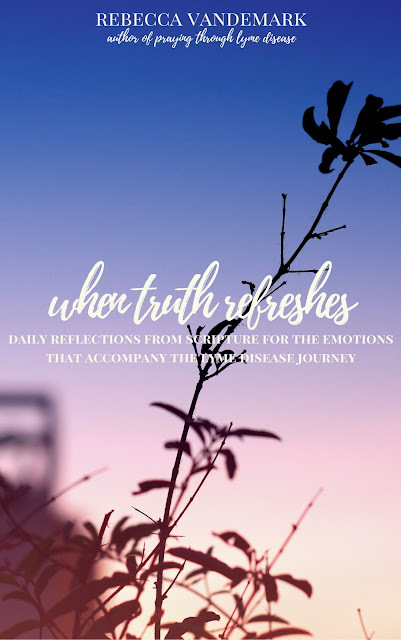 Our emotions can shift and change and there can be times of hardship and grief and times of highs and joy but truth refreshes even the weariest of emotional droughts. I am SO excited to announce that it When Truth Refreshes officially released this morning!! You can purchase it where books are sold or on Amazon (also available in Kindle form) and you can click HERE to purchase it!